Star Trek II: The Wrath of Khan features the original cast; Kirk, Spock, McCoy, Scotty, Chekov, Sulu etc. 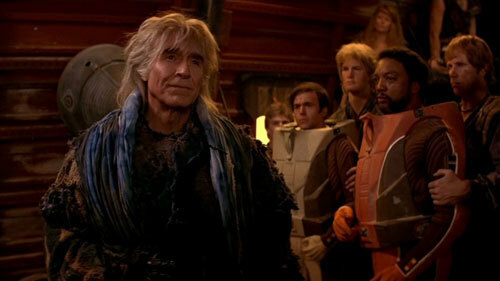 and, best of all, brings back one of the most interesting villains of the original TV series, Khan played wonderfully by strong actor Ricardo Montalban. Can Captain Kirk beat Khan, who has survived isolation and is bent on revenge? In the year 2285, Admiral James T. Kirk (William Shatner) oversees a starship simulator session for Captain Spock's (Leonard Nimoy’s) trainees. 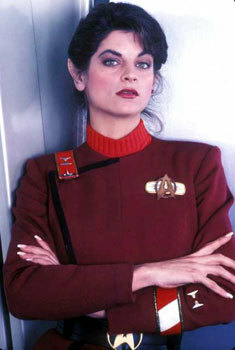 Lieutenant Saavik (Kirstie Alley) commands the starship USS Enterprise on a rescue mission to save the crew of the damaged ship Kobayashi Maru. It’s not a winnable scenario but designed to test the character of Star Fleet would-be officers. Kirk gave up his command captaincy and his pal Dr. McCoy (DeForrest Kelly) tells him he needs to get back into action to feel young and useful again. Meanwhile, the USS Reliant is searching for appropriate planets on which to test The Genesis Device, a technology that can reorganize matter to make a dead planet lush with new life. Commander Chekov (Walter Koenig) and Capt. Terrell ( Paul Winfield) beam down to a planet to check it out but are captured by Khan Noonien Singh (Ricardo Montalban), a genetically superior human marooned there with wife and crew 15 years before by Captain Kirk when Khan tried to take over the Enterprise. When a neighboring planet exploded, Khan’s new world was virtually wiped out and a creepy creature killed his wife. Khan vows to kill Kirk and uses mind control via the small creatures on the planet to make Chekov and Tyrell do his bidding. On a space station where Genesis has been developed, its creator and Kirk’s former lover Dr. Carol Marcus (Bibi Besch) and their son David (Merritt Butrick) work to test the device. Khan finds out about it, sees its potential as a weapon and destroys the station searching for the device while the Enterprise is on a short training voyage. 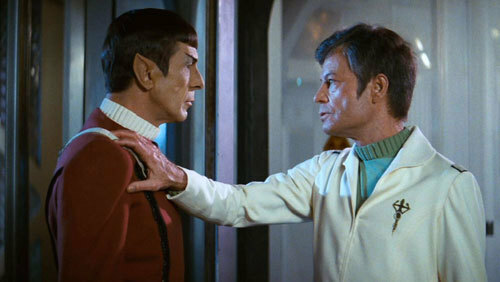 During the training voyage, Kirk assumes command after the ship receives a distress call from Dr. Marcus’s research station. En route, the Enterprise is ambushed and crippled by the Reliant, leading to the deaths and injuries of many trainees. Khan hails the Enterprise and offers to spare Kirk's crew if they relinquish all material related to Genesis. Kirk uses knowledge about starfeet ships that Khan doesn’t know and launches a counter attack. While Khan limps away, the Enterprise goes to the station finding slaughtered members of Carol’s team and Carol and her son hiding below ground in a paradise Genesis has created. Khan locates them and beams up the Genesis device! Khan and Kirk battle it out in their ships inside a colorful nebula where Kirk is able to defeat Khan. 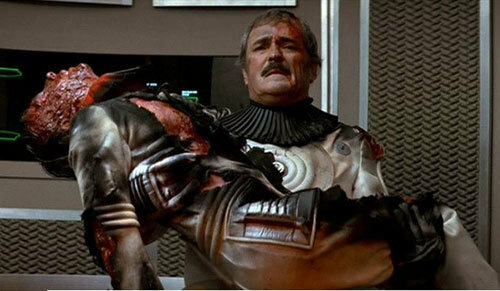 As a final, dying ploy, Khan launches the Genesis device which will destroy everything nearby before it creates life. The Enterprise’s warp drive is crippled. Can the ship and crew escape the area in time to survive? What personal sacrifices will this require? The Genesis Effect: Engineering the Wrath of Khan – is a new documentary revealing a lot of secrets about the difficulties of getting the film off the ground. Filmmakers and actors talk about the many, many efforts at getting a good script. Finally then young director Nicholas Meyer wrote one in 12 days that pretty much pleased everyone.. Very interesting info on show biz and what it sometimes takes to produce a blockbuster movie. Cool. Library Computer is a fun way for fans and newbies alike to further enjoy the movie. While the movie is running, you can click on an index accessing info on people, technology, locations, sets, lifeforms, culture etc. This is useful. X-tras from 2009 include: Production containing info from the actors on forming the story based on the original Trek TV episode “Space Seed”. We get info on the conflicts between not only the filmmakers but the actors. 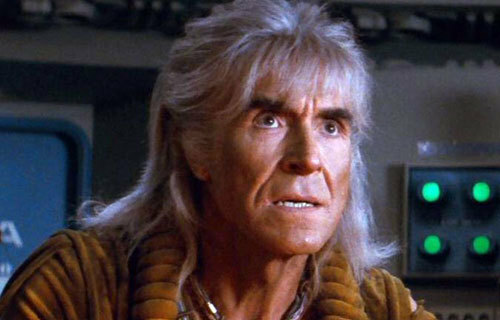 Everybody agreed that Ricardo Montalban did a bang up job as Khan both in the TV episode and the film. Lots of juicy insider info. Lots of fun. Designing Khan focuses on talks with original production designers about deciding on the look of the movie based on the classic Trek TV series; costumes, set designs etc. are discussed. Interesting. Visual Effects – has the filmmakers talking about just how SPFX were done way back in 1981. Models of ships were used. Nothing was done in computer!! All used practical cinematography of the ships and the nebula effect etc. done on sets! This is super interesting especially for kids and teens who have grown up on only CGI effects for films. Well worth a watch. James Horner: Composing Genesis – I think the film score for this movie is one of the most effective and just beautiful ever! The late composer James Horner (he died recently in a plane crash) also composed the Titanic score and many more. He talks about themes for various characters, developing a brand new overall theme song for the movie and more. Great. In The Star Trek Universe fanboys (and girls) can check out Trek collectors talking about their collections of props, weapons and costumes etc. from all of the Trek movies and the TV shows (Up until our modern J.J. Abrams Trek films which aren’t included). If you are a mega-fan, pretty cool. Several Commentaries – the Blu-ray offers voice-over commentaries on both the Director’s Cut (by director Nicholas Meyer) and Theatrical version (Meyer and Manny Coto TV producer of “Star Trek: Enterprise” series). There is a text commentary which looks like subtitles written on the bottom of the screen providing little tidbits. All are useful. This acclaimed classic Star Trek film looks amazing in high definition.. color is great as is sound… like brand new. This is actually my favorite of all the early, classic Trek films featuring the original cast from the TV series. The story is complex but easy to “get”, the character relationships are really rich, Khan is a great villain (very different than played by Benedict Cumberbatch in one of the newer J.J. Abrams Trek films) and he is played just wonderfully by powerful actor Ricardo Montalban. Extras are mostly from 2009 but if you didn’t get a DVD then of the director’s cut of this film, you won’t have them and they are informative and some, as Mr. Spock would say, are “fascinating”.. full of infighting and info tidbits. It’s great to see now-deceased actors Leonard Nimoy, DeForrest Kelly and composer Jamie Horner and others who have left us talking on camera. We could use more updated extras but if you are curious about the “old” Star Trek” or your parents or grandparents were Trekkies, you need to get this great-looking new offering of this… the best of the original Trek films for the whole family. We go four stars. 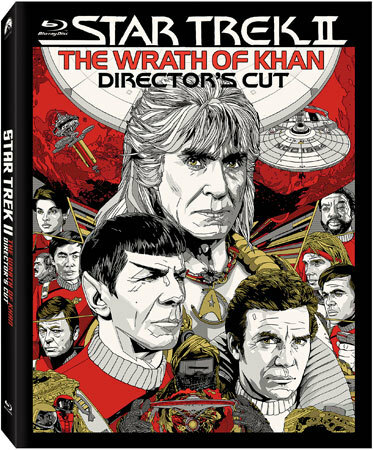 Star Trek II: The Wrath of Khan Director's Cut is now available on Blu-ray! Did you or your relatives watch any of the original Star Trek TV series or the classic films? Did you ever want to explore new planets? Leave a comment.